One of my peer-mentors on Twitter posted the following message. A standard is a target. 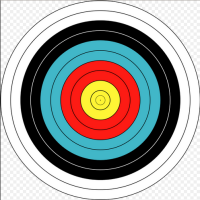 For a simple example, a standard might be like an archery target, for which hitting the center from a specified distance is a success. 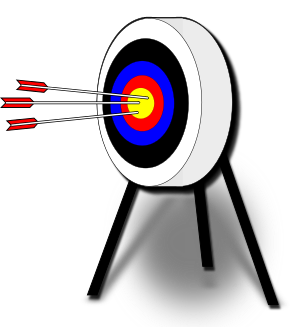 Hitting a bull’s-eye from ten yards might be the target standard for a young or novice archer. Hitting that same bull’s-eye at 50 yards would be a much higher standard. We might expect that only a few novice archers could achieve it. It would be foolish to establish that advanced standard too soon, making a group of novices feel inadequate. Standards work when the level exceeds a person’s current skill, but does not exceed the skill level by too much. Effective standards set out a series of advancing goals/targets for learners. Another goal of a standard is to help evaluate a program. How does the training program help archers to advance from one level to the next so that some eventually exceed the current maximum standard and stand out even beyond the expert level of their peers? Standardizing may achieve some of the same program goals, but also places a limitation on the support program by establishing a “common” goal. The common goal is for everybody who passes through the program. Each and every participant in the program is expected to accomplish the standardized level. Standardizing may actually have the effect of masking the skill of the excellent achievers. They, like everyone else, only need to achieve the standardized goal. What is their incentive to exceed the standard? While the ones who struggle to keep pace have a clear goal, what is the goal for the best performers? If all first-year archers go through a program and 80 percent are proficient, 18 percent meet or exceed the standard and only two percent are in need of improvement, the program might be considered a good one. If most fourth-year archers still need to struggle to meet the same standard as first-year archers, the program probably has lots of detractors. Not all skills are so simple as target archery. That is one significant difference between training and education. A good education isn’t a series of cohorts moving up from ten to twenty and fifty to 100 yard distances, shooting the same kind of arrow toward a target that is harder to hit. Education has many more goals, most of which also overlap with other life skills. A simple example: Knowing the difference between a noun and a verb is seemingly simple. “A cat runs.” First grade students know a cat is the thing of “person, place or thing” — the noun. 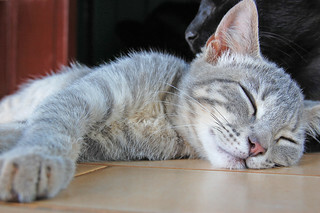 For the verb, young learners have had lots of experience from real life runninng to help them even understand the tense difference between a cat running now and a cat which ran a while back. “Run” and “ran” both are clear as verbs. Then it becomes complicated. “Run” is not always a verb. Little minds still generally succeed in working around the ambiguity. “Bobby got a run in today’s game.” That use of the word “run” as a noun instead of a verb is built into the experiences of any child who has played baseball. When you run around all the bases, you score a run. What about the unfortunate children who have never, ever played baseball and whose families speak only of “futbol” in Spanish at home? Grammar is the way we use words to explain our life experiences. We do not all share the same life and yet are expected to share the same grammar. Education, just like life, is jam packed with ambiguities. Education isn’t a single thread. Education isn’t restricted to the hours inside a school. A child of inner city poverty has a far different “nuance” compared to that of a middle class suburban child. Standards are also elusive targets. They typically attempt to isolate individual threads from a complicated weave of many colors and fabric types. Mastery of any one thread isn’t close to mastery of the full weave. And the cloth we get at the end of schooling has yet to be made into a garment. All of school is practice. At age 18, a **lot** of life is yet to come. How that turns out goes way beyond the standards of any school experience. Standardizing is an attempt to find a balance somewhere between inadequate preparation and excellence for learners. It isn’t practical to set a standardized goal too high because everyone is expected to get to the goal. Education must account for all of its participants, allowing for some to exceed the standards. Encouraging them to do so. Standardizing does not allow for a very high standard such as making everyone ready to be a doctor, everyone ready to be CEO of General Motors. That makes a mess. At that extreme, essentially everyone fails. After all, at any moment, there’s only one CEO at GM. What about the benefit of setting yourself apart, showing your individual strengths? Most of us would probably say that is important. We want to be recognized as something special, good for you to hire, good for a life-long match as a spouse, good in some unique way which attracts the attention of those who want a leader, not just a replaceable human component. Just how does a standardized education system promote that? The successful education system isn’t one which makes an endless stream of standardized clones. The system needs to get children moving ahead, if not smoothly, at least consistently. The system does not want to have learners stall at an intermediate level. Each learner needs the support to overcome the hurdles which may interrupt smooth progress. At the end of the 12th year, we do not need a cohort of duplicates, instead, we need a group of individuals which has begun to find personal strengths so each can be a contributing member of their class and school. The system needs to produce incomplete people who are still interested in taking the next steps, steps which will not all lead in the same direction or reach the same destination. If we must see graduates as components, then we should hope that they are well developed to mesh their skills with the skills of others and make their individual contribution to their next community as they did to the school community. That’s a standard I can support. Can it be standardized?